Star Trek Beyond is the third film in the rebooted franchise. 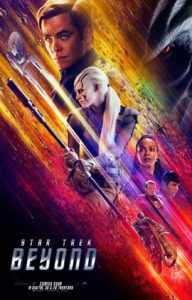 It stars regulars Chris Pine, Zachary Quinto, Zoe Saldana, Karl Urban, Simon Pegg, John Cho and Anton Yelchin (in his last appearance before his untimely death). New to this moive are Idris Elba (Luthor series/Thor films) as villainous Krall and Sofia Boutella as Jayleh who is an alien left to fend for herself by Krall. The Enterprise visit’s a new star base Yorktown, that’s more like a big planet as the size of it is enormous! It is here that they receive a distress signal, an alien in an escape pod pleads for help and the Enterprise goes to respond. After navigating a dreadful nebula, the starship is attacked by lots of smaller ships that, by working together, cause huge damage to the Enterprise. It’s so bad that the crew are forced to abandon ship and get to the nearby planet below that looks like Earth. They are split up into groups. Spock (Qunito) and McCoy (Urban) are stuck together. Scotty comes across Jeylah. Chekov is with Kirk. Whilst the others are kidnapped by Krall and placed in a prison camp. The tension rises as Krall wants something the crew picked up on a previous mission and will do anything to get it! This movie has quite a lot of visual effects. The super age starbase was amazing and so complex. The shots of the Enterprise docking there were some of the best. Krall gives Kirk a worthy foe, with a nice added twist at the end. Elba gives Krall a chilling presence and single mindedness to complete his objective at any cost. I also liked the use of the aliens in this movie, one of them has a very good place to hide things! The regulars gel and light up the screen and it’s a pleasure to watch them. Anton Yelchin’s sad death will have an impact and it’s unclear what will happen to the character of Chekov. I don’t think the part of Chekov could be recast – so it will be interesting to see if a new character is created or they manage with the remaining regulars. I don’t see why they can’t introduce new characters as this is meant to be an alternative timeline anyway. There’s also a ton of great action sequences that keep the adventure zipping along, the space battles are amazing. I liked the starship Franklin which seemed to be a nod to The Enterprise NX. Sofia Boutella is a great addition to the cast and I love her character very much. 10/10 from me. Make sure you check out this movie! Trailer reproduced from Paramount Pictures.